Paul Chambers, bass; Philly Joe Jones, drums. The present album seems to us to substantiate fully the enthusiasm Clark Terry sparked at that Monk date [Brilliant Corners, Riverside], and to more than justify the critics' praise. It is an unusually relaxed, cohesive, and happy-sounding LP, not only because the overall level of musicianship is about as high as you can get, but probably also because a good deal of enthusiasm was involved--a quality that doesn't always seem to be on tap in these days of very frequent (and sometimes casually flung-together) recording activity. Johnny Griffin, for example, is on hand because Clark, hearing him when the Ellington band was in Johnny's home town of Chicago early in 1957, wrote back that he had to have Griffin on his album. Through good timing (Griffin came to New York to join Art Blakey's group) and the courtesy of Blue Note, for whom Johnny currently records, it was possible to use this sensational young tenor man. The rhythm section includes Paul Chambers and Philly Joe Jones, two of the very best in the East, who at the time had been working together for over a year (which always helps) in Miles Davis's quintet; and Wynton Kelly, presently with Dizzy Gillespie's big band, a pianist whom fellow musicians, though not nearly enough of the public, recognize as a formidable performer. The emphasis here is on swinging medium-to-up tempos, a groove into which Clark and Johnny fitted together immediately. Both men have the rare ability to handle swift passages with unrushed ease (as a prime example, listen to "Donna Lee"). Emphasis is also on Terry as a writer. He contributes five fresh and unpretentions originals; and he also demonstrates his ability to get away from standardized routining of tunes (note, for example, the passages in both "Digits" and the blues "Boardwalk" in which the two horns "answer" each other most effectively). The two standards have their own special touches, too: the inclusion of the beautiful, neglected verse of "Stardust," and the Latin treatment of "Old Black Magic" (with cowbell by Terry and claves by Griffin). Above all, there is the consistently warm, clean, brilliant tone of Clark's horn, and the play of his fertile jazz imagination. There is also evidence that he belongs to that solid core of current jazzmen who are able to incorporate and transform to their own uses material that is not strictly and narrowly "modern." There is fundamental gutbucket in "Boardwalk," and there's also the fact that, although Terry at least partially "inherited" half-valve effects from his predecessor with Ellington, Rex Stewart, he has adapted them in ways that are uniquely his. 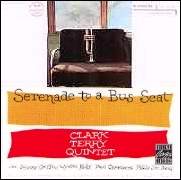 On this LP, Clark Terry comes into his own. It does not seem exaggeration to say that a few more like this will establish him as a truly major jazz figure. --ORRIN KEEPNEWS, from the liner notes.